Korea Summit Press Pool/Getty ImagesThe bodyguards escorted Kim’s car over the Korean border in April. 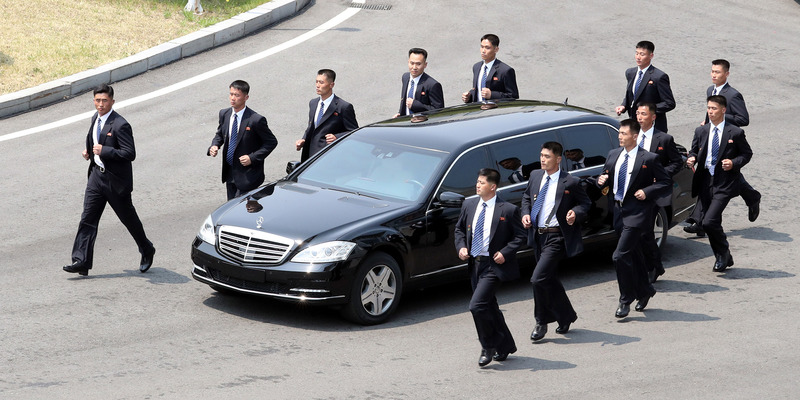 Kim Jong Un travels with a group of bodyguards who jog in formation around his car at significant events. The bodyguards captured international attention earlier this year when they were seen running alongside Kim’s car in South Korea. The men are selected from army conscripts based on physical appearance and abilities. The elite group of bodyguards who defend Kim Jong Un by jogging next to his car have been spotted in action in Singapore ahead of the North Korean leader’s planned summit with President Donald Trump. The men, who captured international attention earlier by running in formation alongside Kim’s limo, are back in action ahead of the historic meeting. Twelve of Kim’s bodyguards, all dressed in dark, Western-style suits, were spotted jogging alongside the North Korean leader’s car in Singapore ahead of the highly anticipated summit, scheduled for Tuesday (Monday evening in the US). The Washington Post’s Anna Fifield posted footage of them in action on Sunday. You can see five bodyguards flanking the car on each side, with two others running behind it. Kim’s bodyguards captured international attention in April after they were seen running next to the North Korean leader’s Mercedes-Benz S-Class limousine as it travelled across the border between South Korea and North Korea. It’s not clear whether the 12 bodyguards jogging alongside Kim’s car on Sunday were the same as the ones in April. The bodyguards are part of an elite military group in North Korea called the Main Office of Adjutants, also known as Central Party Office #6, according to the BBC. As some of the few North Koreans who are allowed to carry loaded guns near Kim, they typically carry a semiautomatic handgun and a backup weapon. Be approximately the same height as Kim. Not have any visual impairments. Demonstrate a superior capability in fitness, marksmanship, and martial-arts skills. The recruits then have to pass rigorous background checks, in which their parents and grandparents are also vetted. Once passed, they are then drilled on the use of handguns, evasion techniques, and martial arts. They are also trained for their observation skills and ability to neutralise perceived threats using only their hands and bodies. It’s also clear the bodyguards have to be in excellent physical condition, as seen by their jogging in dark suits around Kim’s car in 30-degree-Celsius (86 Fahrenheit) Singaporean weather. Kim is terrified of being assassinated both within and outside North Korea. Pyongyang has accused the US and South Korea of plotting to kill Kim with chemical weapons in the past, and China is rumoured to have explored an assassination plot involving his half-brother, Kim Jong Nam. The North Korean leader also travels with a personal portable toilet intended to prevent other countries from gaining insight to his health from his stools. Singapore is also taking extraordinary measures to protect Trump and Kim this week. The city’s government demarcated its central district and Sentosa island, where the two leaders will meet, as “special event” areas from Sunday to Thursday. Drones, flammable materials, and items like flags and banners will be prohibited from those areas, The Straits Times of Singapore reported.